See more objects with the color tan lightcoral thistle or see all the colors for this object. This is a Poster. It was designed by Experimental Jetset, Erwin Brinkers, Marieke Stolk and Danny van den Dungen and made for (as the client) Paradiso. It is dated 2010 and we acquired it in 2015. Its medium is die-cut offset lithograph on paper. It is a part of the Drawings, Prints, and Graphic Design department. 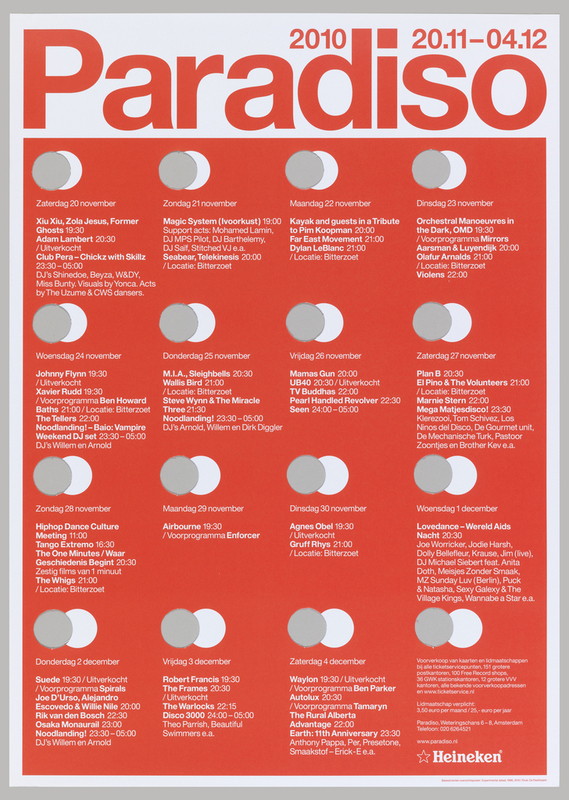 In 2010, Experimental Jetset was asked to redesign a poster campaign that they had originally designed in 1996 for rock concert venue Paradiso. Paradiso has played a significant role in the Dutch rock- and counter-culture since its opening in 1968. 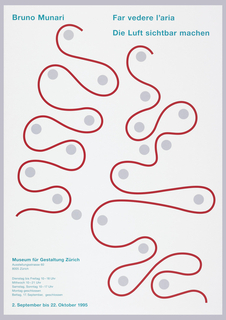 Experimental Jetset’s 1996 design for a tri-weekly poster series had used a series of capsule-shaped holes to reveal the surfaces on which they were hung. For their updated design, the designers transformed the capsule-shaped holes into circular ones, which were die-cut to overlap or eclipse the printed circles beside them, reminiscent of the popular calendar posters showing the different phases of the moon. The design team appreciated this lunar parallel for its relationship to the nocturnal schedule of the concert venue. They streamlined some of the poster’s elements, eliminating the arrows surrounding the venue’s name, but they incorporated a second color into the final design. It is credited Gift of Experimental Jetset.